r\a\w f\o\r\m\s presents: ‚Lait Noir du Matin‘. 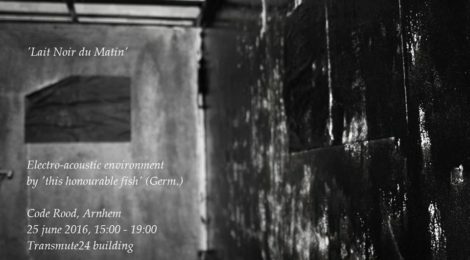 ‚Lait Noir du Matin‘ is the title of a four-hour performance that will take place in the Transmutebuilding in Arnhem. In the building an electro-acoustic environment will be created, based on the ‚Todesfuge‘ by Paul Celan. Anja Kreysing: accordion / electronics. + Additional sounds by Les Horribles Travailleurs. During the ‚Code Rood‘ event, with several exhibitions on the former militairy complex ‚Buitenplaats Koningsweg‘, now a ‚cultural enclave‘, north of Arnhem.